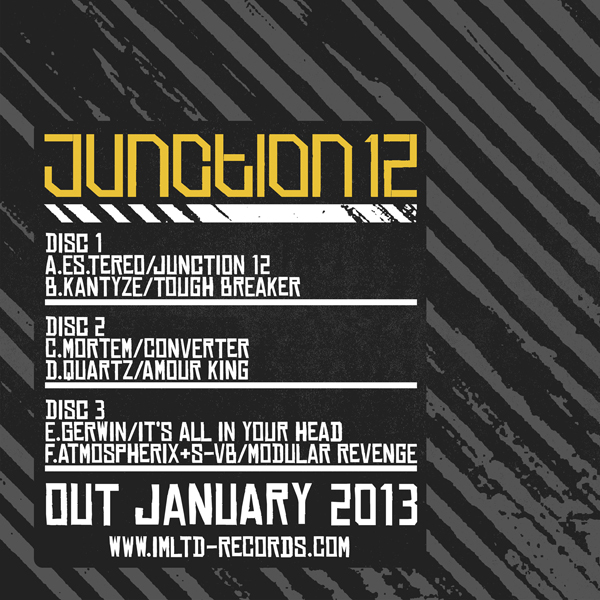 2012 has been a fulfilling year for IM:Ltd and with the sonic summer being definitively over, the French based label gets back moodier than ever with ‘Junction 12’, a collection of 6 meticulously picked Drum & Bass tracks from some of the hottest talents on board that comes in the form of a 3×12” vinyl series. Disc 1 sees Berlin producer Es.tereo going back to some of his darker playgrounds with ‘Junction 12’, an autonomic influenced stepper forged on obsessive robotic vocals and industrial klanks. On the B side, French techstep veterans Kantyze deliver a surprisingly uncluttered roller named ‘Tough Breaker’. Simple & efficient. With releases on labels such as Goldie’s legendary imprint Metalheadz , 2012 has been a wealthy year as well for Mortem as he returns to IM:Ltd with ‘Converter’, another brilliant track that won’t contradict his well earned reputation for creating music that causes serious damages on dance floors across the globe. The flip consist of ‘Amour King’, the first vinyl effort from Quartz , a new duo hailing from Cardiff. On Disc 3, Gerwin steps up his game with ‘It’s All In Your Head’, a seedy piece of minimal tech funk. Once again, his ease and versatility definitively makes him one of the name to be watched out for in the coming months. Last but not least, Belgian producer Atmospherix teams up with S-Vb for some ‘Modular Revenge’. This entry was posted in The Robot Recommends and tagged 2012, amour king, b, bass, berlin, bodypop, bulgaria, converter, deep, download, drum, electronica, Es.Tereo, free, gerwin, Goldie, IM:Ltd, junction 12, jungle, junglist, killian, Metalheadz, modular, mortem, new, quartz, revenge, robot, tough breaker, vibe by Killian. Bookmark the permalink.